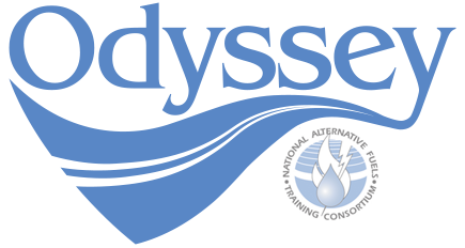 For their Odyssey 2014 event, the North American Green Fleet Forum, East Bay Clean Cities Coalition, and Sacramento Clean Cities Coalition teamed up to provide the NAFTC’s Petroleum Reduction Technologies (PRT) training to almost 60 fleet managers. This training is aimed at reducing petroleum consumption and its effects on the economy, health, and the environment and is designed specifically to raise awareness and foster a greater understanding of alternative fuels, alternative fuel vehicles, advanced vehicle technologies, petroleum reduction technologies, fuel economy, idle reduction, and related technologies. The material in this course highlights six alternative fuels and two technologies and strategies that can help reduce U.S. dependence on foreign oil. East Bay Clean Cities and Propel Fuels will be handing out FREE trial five gallon fuel cards good for E85 Flex Fuel or B5 biodiesel, and will be providing information and demonstrations of these renewable and domestically produced biofuels. Event Highlights: The East Bay Clean Cities Coalition held two events in support of 2010 Odyssey Day. The first, a clean air vehicle grant funding workshop held on the University of California, Berkeley campus, had eighty fleet professionals in attendance. The audience consisted primarily of local and state government fleets but also included private industry fleet representatives and federal fleets. The agenda featured presentations by all the major clean air grant funding sources including the U.S. DOE Clean Cities Program, EPA, California Energy Commission, California Air Resources Board, and the Bay Area Air Quality Management District. The second event was the Green Drive Expo held at the Craneway Pavilion in Richmond, California. This event had 3,700 attendees and featured a keynote address by Chelsea Sexton of “Who Killed the Electric car” fame and had a multitude of clean air vehicles on display such as the Mitsubishi i-MiEV, Tesla Roadster, Chevrolet Volt, Nissan LEAF, Honda Civic CNG, Ford battery electric Focus, Toyota Prius PHEV, GM EV1, Th!nk City, Ford Escape plug-in hybrid, and numerous aftermarket and converted /upgraded vehicles.